It’s Pocahontas Number Three coal, from the famous seam in Tazewell County, Virginia, and according to Brendan Burke it is great for blacksmithing. After Burke moved the coal from the edges of the forge into the firepot, he labored at the blower churning air through the tuyere and into the fire. Green smoke rose from the coals as Burke fed the flames. “The smoke is just weakness leaving the fire,” said Burke. More precisely, impurities, like sulfur, burning off of the coal as it smolders create the green smoke and turn it into coke that is very different from the kind you would drink with your value meal. 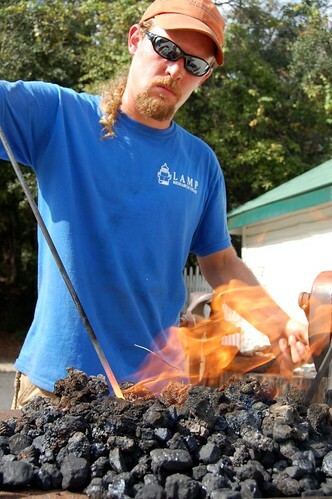 To a blacksmith, coke is the very high quality source of heat left once the “weakness,” or impurities, burn away. 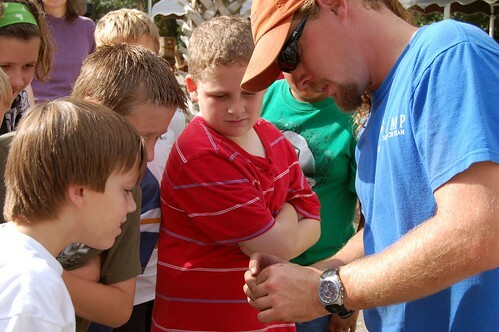 Blacksmithing is a hobby for Burke who is actually an underwater archaeologist with the Lighthouse Archaeological Maritime Program (LAMP), which oversees the St. Augustine Lighthouse & Museum’s volunteer boatbuilding program, LAMP Boatworks. 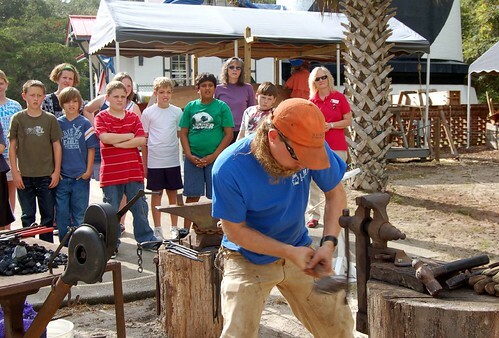 In the days before mass-produced parts and fiberglass hulls, blacksmithing was an indispensable skill that nearly met the same fate as eight-track tape players and rotary phones, but a visit to the St. Augustine Lighthouse & Museum will reveal a very industrious – and educational – scene. Upon entering the courtyard at the Museum visitors see a sign, “Back to 1888,” and were it not for the modern garb and classrooms of children waiting, hands raised to ask questions, one might think the sign to be true. Just through the brick and wrought iron gates past where the Victorian keepers’ house sits, opposed to the 1874 light tower, transplanted northern light keepers would have built traditional New England-style boats. A boat was a necessity for a light keeper; it allowed him to perform his duties and help provide for his family. His tools, hardware and fasteners would have been forged in the same fashion; metal heated to a bright orange yellow and beat on an anvil. More than a century later, volunteer boat builders work to learn and recreate the craftsmanship found in hand built craft that littered inland Atlantic waterways. 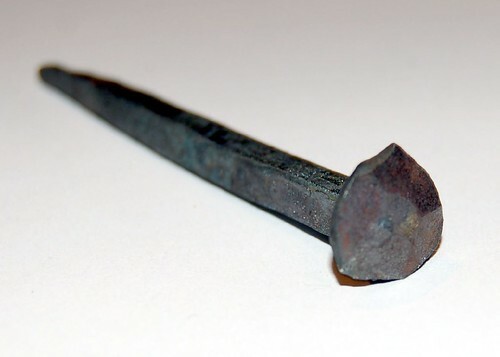 The rose-headed nails that Burke “heat and beat” are square nails, with a chisel point and patterned head. Burke also forged rolled steel into chain links, a commonly used item aboard ships during the age of sail and steam. Burke hopes that they will be able to do the forging demonstration a few times a year as his forge will supply LAMP Boatworks with specialty hardware for future projects. LAMP Boatworks works in the shadow of the lighthouse tower every Tuesday through Thursday, from 9 a.m. to 12 p.m. To volunteer or find out more about the educational programs at the St. Augustine Lighthouse & Museum or LAMP, visit www.staugustinelighthouse.com, read the Keepers’ Blog by clicking on the “blog” tab on our homepage, or call (904) 829-0745.